Lillian Hellman finished writing “Watch on the Rhine” in early 1941, shortly after Germany had invaded Poland and shortly before the United States entered World War II. The action is set late May 1940 in the home of Fanny Farrelly (Caitlin O’Connell), a wealthy widow who lives near Washington, D.C., and her middle-aged son, David (Hugh Kennedy), an attorney. She’s nervously awaiting the arrival of her daughter, Sara Muller (Sarah Agnew), whom she hasn’t seen during the 20 years that she has lived in Germany with her German husband, Kurt (Elijah Alexander). Nor has Fanny seen their three children. She has two Romanian houseguests, the impoverished Count Teck De Brancovis (Jonathan Walker) and his American wife, Marthe (Kate Guentzel) a friend of the Farrellys. Marthe has never loved him, but she has fallen in love with David. Kurt is an anti-fascist activist, while Teck is a German conspirator. Clashes are inevitable. In the end, family ties prevail. In this co-production with the Guthrie Theater of Minneapolis, director Lisa Peterson carefully orchestrates the action as the characters undergo transformations. Perhaps the most dramatic change occurs with Fanny. She starts sarcastic and autocratic but becomes empathic and loyal to family despite the risks. The impressive living room set is by Neil Patel with lighting by Alexander V. Nichols and period costumes by Raquel Barreto. The sound and music are by Paul James Prendergast. Aaron Preusse is the fight director. 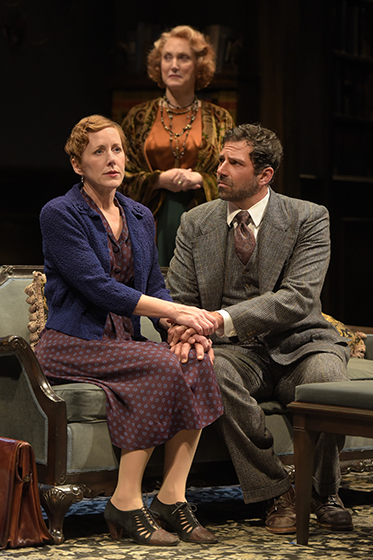 Running about two and a half hours with one intermission and a short pause, “Watch on the Rhine” will continue through Jan. 14 in Berkeley Rep’s Roda Theatre, 2015 Addison St., Berkeley. For tickets and information, call (510) 647-2949 or visit www.berkeleyrep.org.